The ezine from www.better-fundraising-ideas.com we hope you will find it interesting and useful. As I write this in April 2015 the world seems a very troubled place. Wars and insurgencies across many parts of the globe, austerity following the financial crisis and the ever increasing effects of climate change. Faced with so much that is truly desperate and awful it is easy to be overwhelmed and simply fall into despair. To feel that your efforts are insignificant. I don't think however that we should think that way. There is so much more to this world than the horrors we watch on our nightly news or the politics that go on in our seats of government. There are many millions of people out there all thinking in a very different way than those who are simply filled with hatred. People who want to change things, to heal, to make things better, to live with a smile on their face rather than an angry scowl. The best thing about running the website is all the great emails and ideas sent in by people from all around the world. Up to 5000 people every day visit the site looking for ways to support good causes. These are the normal, decent ordinary folks who are trying to do their bit to make the world a better place - whether that's raising money for medical equipment, repair their local church, support their local youth group or even enable their local cheer squad to afford new uniforms. All of these things enrich our lives and make things simply better in every way. The way to overcome things that seem insurmountable is to pour all that you can into what you can achieve and that's usually in your local community. Good fundraisers are seldom grand-standers, shouters or ranters. They are the tireless army that works in the background often with little thanks but always with the satisfaction of knowing that they have added rather than taken away. We start this time with a great new idea for a fundraising event with a difference - an Angel Festival. This really takes inspiration from the growing popularity of Scarecrow Festivals as whole-village fundraising events. These mini festivals where dozens of scarecrows are placed around towns and villages are becoming quite common and have proved to be a great way to bring communities together, raise money for good causes and....most importantly.... have a bit of fun! An Angel Festival is really a variation on the same idea but taken in a slightly different direction. Imagine a whole day of events or a village fete or fair based around angels. The main ingredient to the festival will always be a whole load of home-made angels (imagine a scarecrow made like an angel) set out in some form of exhibition. From that basic idea all sorts of angel related activities can follow. 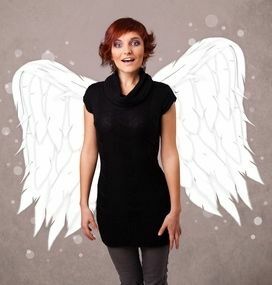 As well as the angels think of the fun you could have coming up with ideas for stalls related to the theme and picture your volunteers and fundraising teams all wandering around with fancy dress angel wings on their backs. An angel festival would always make a great church or faith group fundraiser but its not only for religious organisations. Imagine different schools or youth groups competing to produce the best angels, all to be exhibited at the local town hall, shopping mall or high street. There are lots more ideas for holding an Angel Festival on the website. So if you want to do something a bit different. Or add new life into a tired old village fete give it a go. Its guaranteed to give your fundraising wings. A guide to Fun Ways To Fundraise for your community, church or charity. 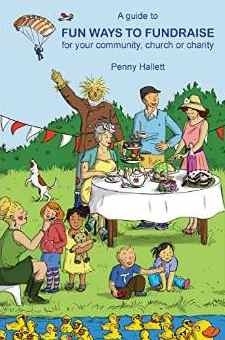 This great book by Penny Hallett is the perfect guide to fundraising for all sorts of charity groups. The book is beautifully written and very clear and easy to understand. Whatever you are fundraising for you will find ideas and inspiration here. The book begins with a handy 12 steps to successful fundraising which provide a great set of background checks for anyone planning a fundraising event. It then goes on to list out a whole range of ideas, with just enough information to set your own creative juices flowing, all set out in well thought out sections. There are also some very useful and easily understandable explanations of how to keep things legal and safe. These are from a UK perspective but the basic ideas would be applicable anywhere. This book is a beautifully clear guide to amateur fundraising. Highly recommended. Pinterest is rapidly becoming a key tool for non profit groups. For anyone not familiar with Pinterest it is a way of saving pictures you find on the web onto a series of online boards. This allows any group to share pictures of their activities or good cause and also save or showcase good fundraising ideas. The great thing about Pinterest is that its very easy to do and any picture you come across that takes your fancy can be easily pinned to your boards. Your boards can be private or shared with anyone. A quick little personal note my partner Karen has recently set up a new online Sewing Supplies and Gifts website. The Drapers Daughter is super cool and proving really popular. All of the research to set this business up however was undertaken using Pinterest and it is also a main driver of traffic to the website. If your group is not using Pinterest yet do check it out. It really is lots of fun and really useful. 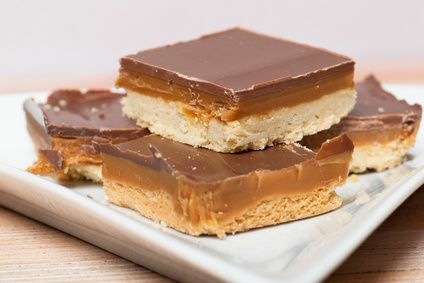 As befits its name this caramel and chocolate shortbread has a real touch of class about it. Its also really popular and makes a great bake sale offering. Line a 23cm/9in square cake tin with baking parchment. 2. Add in the caster sugar and pulse or mix until combined. 3. Tip the mixture into the lined cake tin and spread it out evenly with the back of a spoon. Then press the shortbread down nice and firmly firmly with your knuckles so that it is tightly packed in the tin. 4. Bake the shortbread for 30 minutes or until very light golden brown and then set aside to cool. Heat the butter, condensed milk and golden syrup in a saucepan, stirring occasionally until the butter is melted and the mixture is smooth. Increase the heat and bring the mixture to the boil, stirring frequently. The caramel will thicken and turn golden-brown. Set aside to cool slightly, then pour over the cooled shortbread. Melt the chocolate in a bowl set over a pan of simmering water, stirring regularly. When the chocolate has melted pour it over the caramel and set aside until the chocolate has cooled completely and set firm.